In 2012 we got cat-ear hair-dos, an increasing appetite for salty mold, and a tower with a silly name. What wonders will 2013 bring? We’ve gone through Trendy’s predictions and came up with a list of themes that look good to us. Basically it boils down to this: smart phones continue to up the convenience factor, and people have to work harder to get away from convenience and to make up for all the energy it saves. 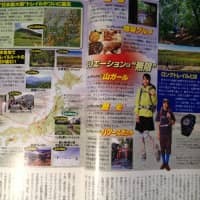 Running and hiking have been big the last few years, and Trendy predicts that this will continue, and that people will invest even more in these hobbies. 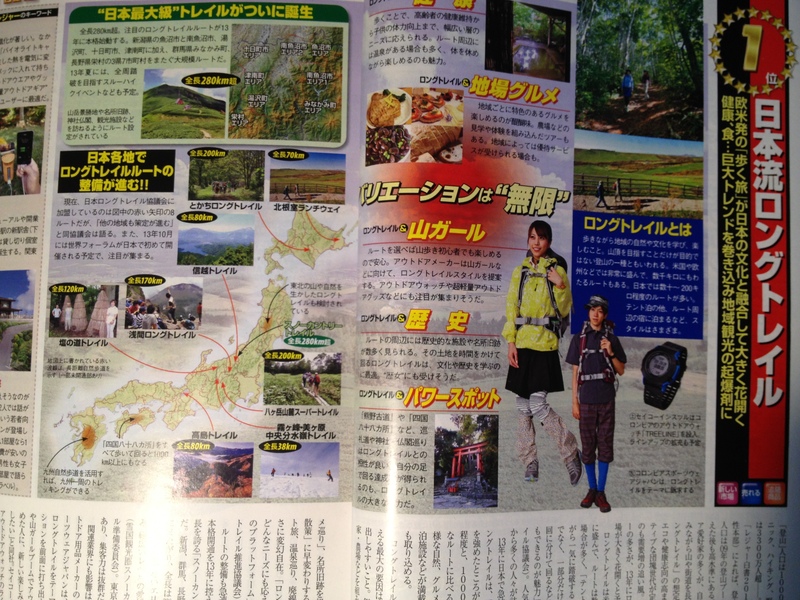 The magazine anticipates that hikers will head further into the hills, taking to what it calls the “long trails” that are dozens (possibly hundreds) of kilometers long, mostly in the Alps of central Honshu. Naturally, these overnight trips will require more gear than the yama girls have acquired thus far, including camp stoves and camp stove-operated mobile phone chargers. Hikes deep into the heart of the country also fit in nicely with other growing interests that have been driving travel trends recently, like history and power spots. One of the biggest hits of 2012 was Kirin’s Mets Cola. Billed as the world’s first health-soda, the product claims to inhibit fat uptake. It got tokuho billing, the government-issued health food label usually reserved for products like bio-yogurt. Trendy anticipates that other ordinary edibles will ramp up their ingredients to qualify as tokuho products, and that 2013 will see more typically sweet things – from donuts to umeshu (plum wine) to teriyaki sauce – getting the low-calorie treatment with sweeteners like D-Psicose. Likewise, “water enhancers” like Kraft’s Mio Energy, which look like colored eye-drops but presumably have a Crystal Lite effect, look to make good, old-fashioned water more palatable to soda addicts. Trendy also sees gadgets that gamify weight-loss and fitness, like Nike’s FuelBand and Panasonic’s EW-NK63 pedometer – both of which beam data to smartphones – as being likely hits in 2013. And (sigh) it looks like Fujitsu has gone and made a pedometer for dogs, the “wandant” (“wan-chan” being the word for puppy). As the pampered puppies of years past are now overweight middle-aged pooches, we’re probably going to see more human-driven weight-loss and exercise trends trickle down to the canine population. Now that we’ve confirmed that Japanese consumers are buying into smartphones, it is likely that we’ll see more crossover products on the market. Expect more digital cameras that allow you to upload photos to a smartphone over Wi-Fi – like Nikon’s new Coolpix S800C, which is also an Android device itself – to hit the market in 2013, says Trendy. Last year Moleskin introduced its “Smart Notebook” series, which is designed to sync nicely with the popular smartphone app Evernote. According to Trendy, Japanese office and school supply manufacturer Kokuyo (they make those ubiquitous “Campus” notebooks) has now launched its own series of smartphone-ready stationary, CamiApp, along with its own app.